This travel fever has seeped into my kitchen as well, thanks to Raw Spice Bar. They have sent me some spice packages to try out and I am OBSESSED! Each month, they send you 3 spice packets and recipes to use each one. 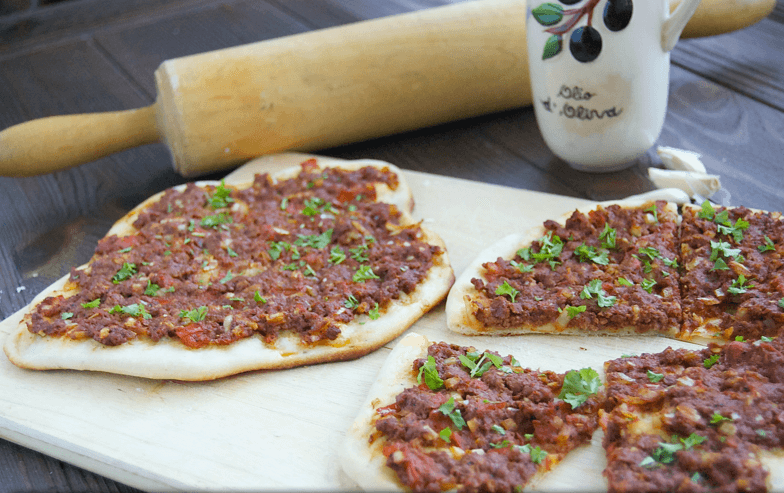 This recipe came from their Turkish-themed month. 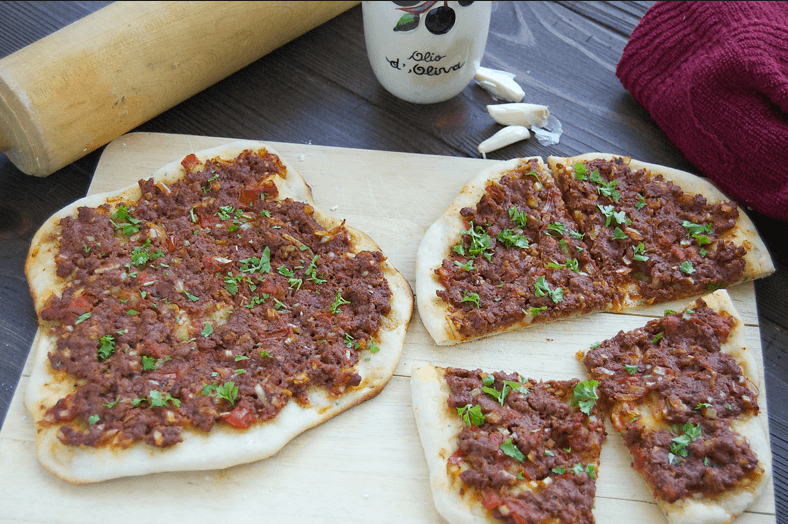 Baharat is a staple in Turkish cuisine, meaning “spices” in Arabic. It is use in practically anything and consists of coriander, cumin, black peppercorn, sweet paprika and warm spices like cinnamon, allspice, and cloves. I am always trying to discover new foods and recipes to try, and Raw Spice Bar makes it super easy. Each month they have a different cuisine theme for the box. Stay tuned for some Malaysian recipes from their spices soon! For the flatbread, combine the yeast, flour, sugar and salt in a food processor. Pulse until combined. Slowly add the water until a ball forms, then transfer to a floured surface. Knead the dough until it is smooth and elastic. Form into a ball and place in an oiled bowl to get rise until doubled in size (about 1 hour). Punch down the dough and split into four equal balls. Cover with plastic wrap and let rise for an additional 45 minutes. For the sauce, combine the olive oil, Baharat spice blend and tomato paste in a large bowl. Add in the garlic, tomato, onion, lamb and salt, mixing to combine. Preheat oven to 475F with a pizza stone in the bottom. If you do not have a pizza stone, preheat the oven to 500F with a well oiled cookie sheet. When the dough is ready, roll each ball out into a thin disk (about 8"-10"). 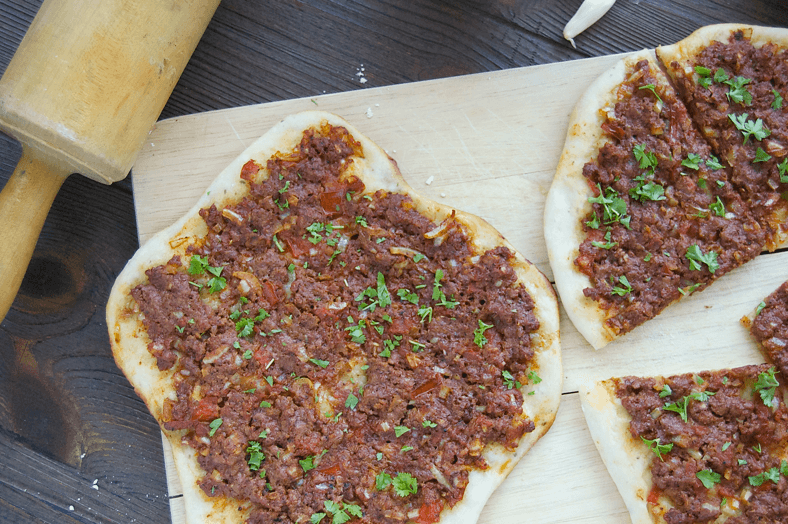 Spread topping evenly onto each flatbread. Bake until crust is golden and lamb is cooked through (about 6-10 minutes).